It took four years. Four years to get from this to that there. Their first efforts have hung on their art wall, surviving every single purge of art at their request, for the past four years. Then one night a few weeks ago The Monster asked if we could do it again. "Mama, can we do more of that up down sewing with thick thread? Except, can we do it properly?" Of course sweetie. And I panic. Because I have no clue how to actually do it properly. Thankfully I have a rather extensive book library for sewing. 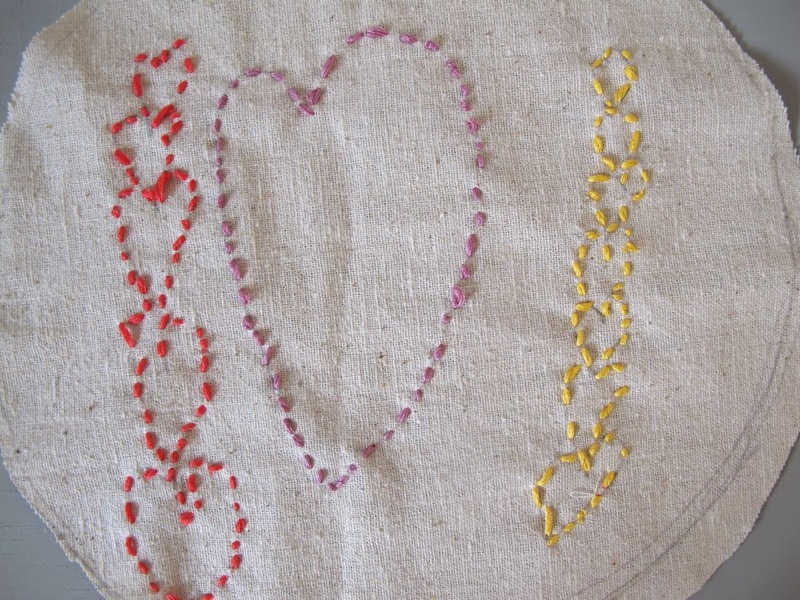 A few resources to the rescue and we teach ourselves a running stitch and a back stitch. We stock up on a few bits of floss (all in pinks and purples except for one lonely skein of yellow. We buy hoops. And we put their little brother down for a long winter's nap so he stays out of our way. 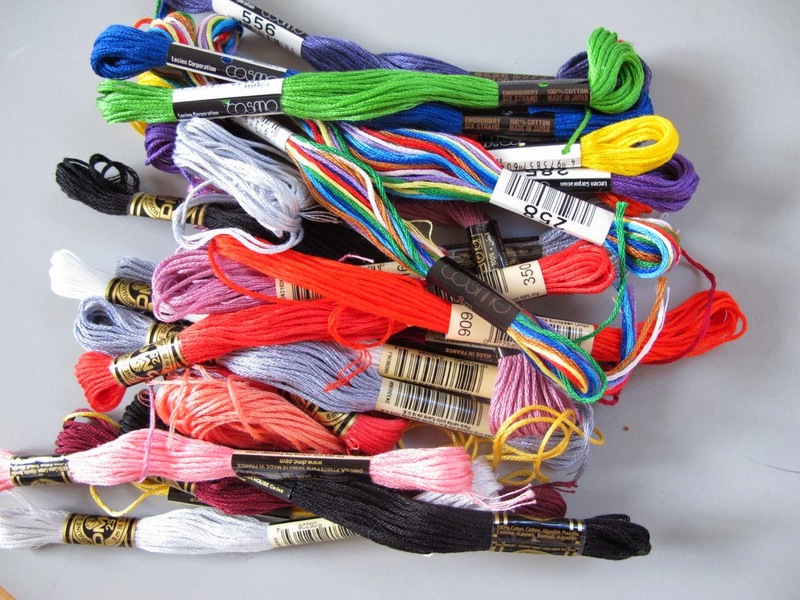 They each drew a picture on a piece of scrap osnaburg, lightly and with a pencil, selected their floss, tightened it up in the hoop and we sat down to stitch. And we stayed there for two hours! This activity kept my 7 and 5 year old girls still for two hours. I'm still in shock about that. I was on cutting, floss separating, and knot tying duty. 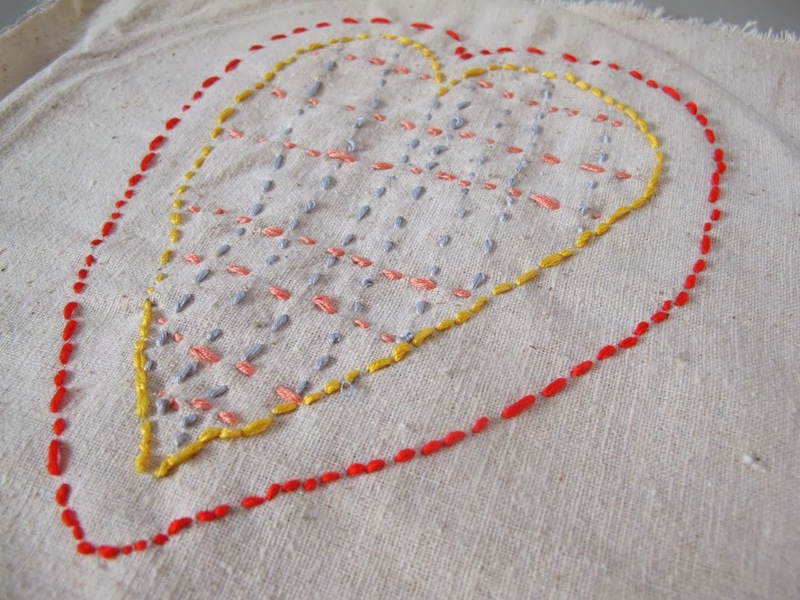 We've got some skills to learn - sometimes they don't always pull the thread all the way through and we get tangles, and their back stitch and running stitch look kind of the same. But this first effort is not any better than I probably could have done. And the best part? They want to do more. Love it. You're such a good mom. It's so fun to pass on the love for stitching to the littles. Cheryl, my grandmother taught me to embroider starting at age 6 and to this day it is something that I love to do. I passed on the love of cross stitch to my daughter and no matter where we go we are never at a loss for something to do. Bless you for teaching your girls a skill that is sure to bring them many hours of peace and pleasure. embroidery is hands down my favorite kid craft. your daughters did an amazing job! it looks great. and they'll get better. 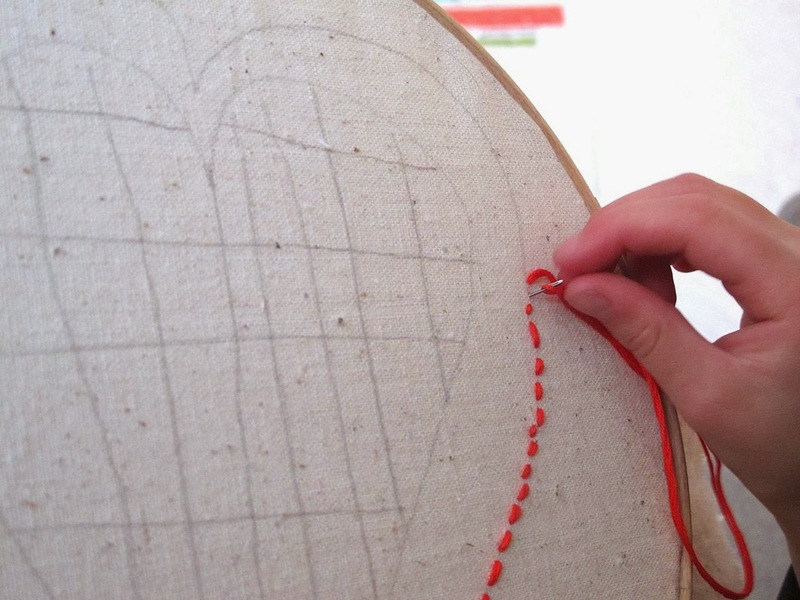 Some Montesorri programs teach overcast or buttonhole stitch -- they could edge a doll blanket with that stitch. They did such a beautiful job! What a great treasure! Both the product and the time spent with Mommy! Looks like a proper job to me. I love to embroider. I am sure if you help them frame their pieces they will be thrilled. Little pillows with their stitching would also be so cute. My grandmother taught me to embroider when I was 5 and 6 and then it was ongoing for years. 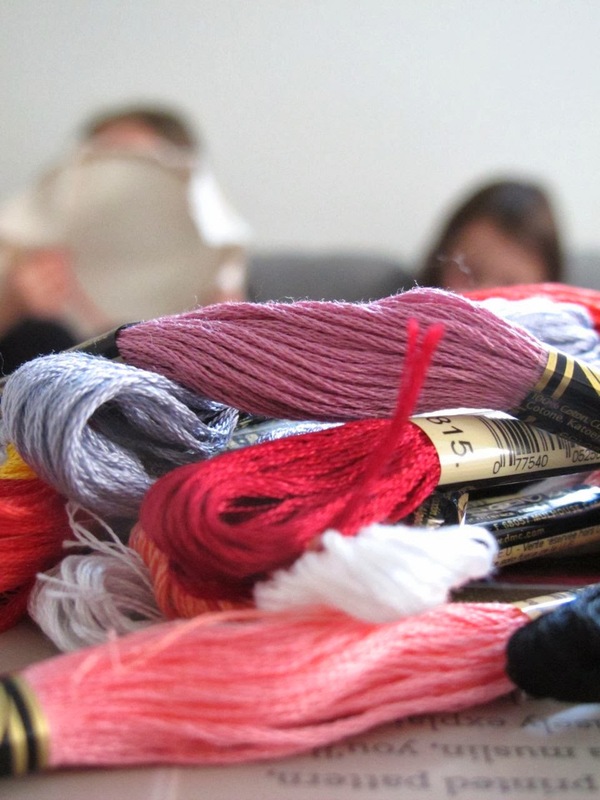 I am sure that you can learn along side and just ahead of them for a long while, it is so much fun to see young people creating and stitching. So sweet! The girls did a terrific job. They will remember those two hours spent sewing for the rest of their lives. It looks lovely, well done girls!!! Cheryl at the scholastic book fair (at our school) they had a children's stitchery book which would be perfect for them - lots of photos, small projects etc. Its great when kids learn a new skill, even better when its a skill that we approve of! Forgot to say that I have been letting my 3 yr old grandaughter draw pictures on fabric that 'we' then make into gifts from her. Daddy got a cushion for Fathers day and her other gran got a lap quilt for her 80th birthday. She really enjoys 'helping to sew', cutting some fabric and snipping the threads and is very proud of the end results.